By upgrading to one of our pro plans you can use your very own custom domains in all your links to increase your own branding. On your dashboard click your profile pic in the top right to reveal the drop down menu. Click the “My Account” link. 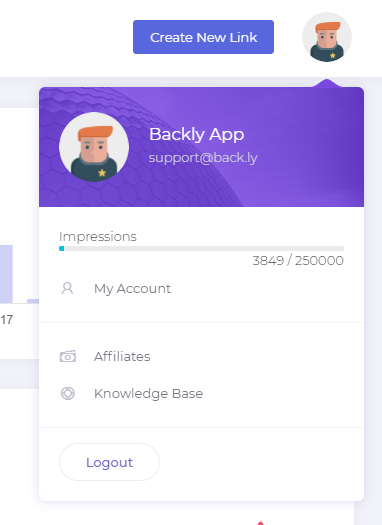 The right sidebar will then be revealed with your account details showing. 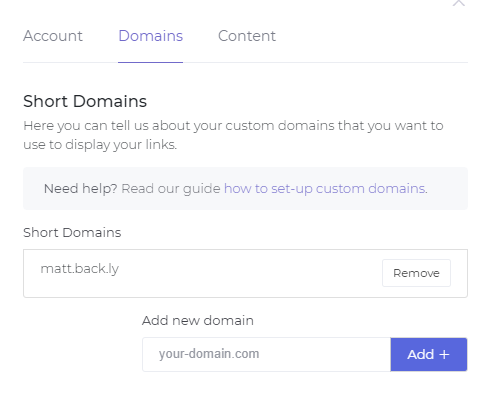 Click the middle “Domains” tab to get to your short domains settings. Then enter your choice of domain you’d like to be able to use on all your backly links and click “Add”. You can add as many domains as you’d like and all of your links will work with all domains you set up with us. Just make sure its not being used for any other purpose. You can always create a subdomain and use that instead. If you need any help setting up your own domain let us know straight away and we’ll be more than happy to walk you through it.